As is now all over the wires, Robert Schuller died yesterday. 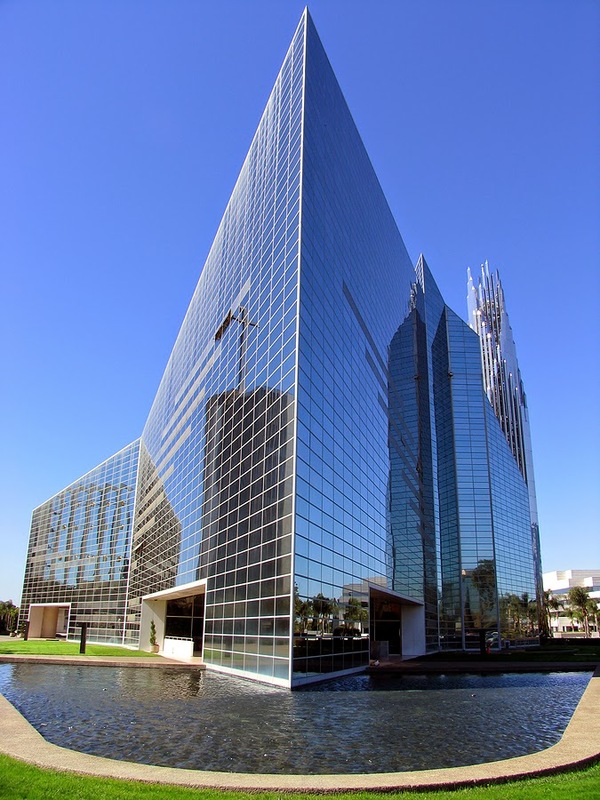 I worked at the Crystal Cathedral on and off from 1996 to 2004. For much of that time, I worked in Schuller's office as part go-fer, part chauffeur for Schuller and the weekly guests who appeared on the Hour of Power. It was ridiculously demanding in terms of hours (I often sympathized with on-call doctors and police officers) but also a very exciting time in which I got to meet many celebrities and interesting authors who would come to the Hour of Power to plug their books or movies. One particularly memorable day was when I rode shotgun as we drove Schuller to Bob Hope's funeral; it was like a very special episode of Hollywood squares. As we waited in queue of limos exiting the parking lot, we were deliberately cut off; as we braked suddenly, the back window rolled down and Jackie Mason yelled from his limo, "Hey Bob, it was good to see ya!" As many news reports are noting, the Crystal Cathedral went bankrupt as donations completely bottomed out when Schuller retired and several of his children engaged in a power struggle for control of the ministry. Although I imagine they wouldn't see it that way, it was clear even back when I worked there, that some of the family members and their spouses were getting compensation that exceeded what seemed appropriate for work in a ministry. Adding to the financial woes, Schuller, who was given an honorary patron's membership by the AIA, built a visitor center that left them with a huge debt. 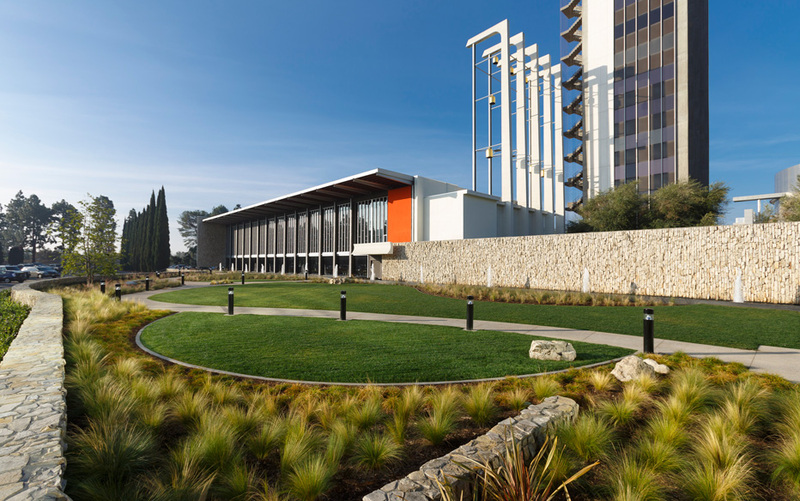 In the wake of the bankruptcy, the Catholic Diocese of Orange purchased the forty acre campus and its buildings, four of which are designed by the great architects Richard Neutra, Philip Johnson and Richard Meiers. In fact, it is the only property that has buildings by three AIA Gold Medal winners. Of course, the Crystal Cathedral is the most significant building, even though I personally prefer Neutra's Arboretum and Tower of Hope (my wife and I were married in the chapel at the top). While I feel bad about how badly things ended for the ministry, I am extremely glad that the buildings will continue to be used for religious services and did not become an auditorium or some private use. Neutra introduced Schuller to his philosophy of “bio-realism,” which was developed in his book, Survival Through Design. His philosophy was that architecture should be “shaped by the biology of the creature who will live in the structure.” Schuller embraced this perspective and has demanded it from all subsequent architects with whom he has worked. He notes that there is an inherent spirituality in the art of architecture. Yesterday, I spent quite a bit of time thinking about my time working for the Cathedral during which I got to spend a great deal of time with Schuller himself, although most of it was while I was driving and he was reading the paper. But since I was in graduate school at the time, we would occasionally discuss theology or church history. In fact, he agreed to allow me to interview him a bit more formally so that I could do an independent study focusing on 20th century 'therapeutic' gospel movement of which preachers like him and Norman Vincent Peale were such an important part. I looked over the paper I wrote for that class, and thought I would share some of what I wrote there. There is no need to go over biographical details here, as that has been covered. But, Schuller's theology and approach have received a great deal of criticism over the years, and I think they are worth covering, primarily because I think he has understandably but inaccurately been lumped in with prosperity gospel preachers such as Joel Olsteen or Creflo Dollar. While the tapes from my interviews with Schuller are gone, I remember quite clearly Schuller's frustration with his critics who consider him to be a prosperity preacher. He was baffled by how his critics could not understand that he did not view success in monetary terms. He said that, although it might be the case that success brings wealth, success should be measured in terms of wether one's work is Kingdom-building. He also asserted that failure (its meaninglessness) was just as important of an element of his teaching. Since one's self-esteem is founded on one's relationship to Christ, one is free to attempt huge dreams because failure would not be devastating, as it is for one whose value and self-esteem is based on their acheivements. I think part of the problem was that Schuller knew what he believed, but for such a great communicator, he clearly presented his message in a way that could be seen as prosperity preaching. When Schuller began preachiing in Southern California, he realized that his preaching style was overly theological and uninspiring. Schuller was given the Dale Carnegie classic How to Win Friends and Influence People and decided a more positive approach was needed. He also reread The Power of Positive Thinking by Norman Vincent Peale. He determined that he would “adopt the spirit, style, strategy, and substance of a ‘therapist’ in the pulpit.” (Schuller, 2001, 172) After two years of preaching from a snack bar at a drive-in, Peale delivered a guest sermon which drew an estimated 4,000 people. After this sermon in 1957, Schuller began to style his body language to be more like Peale’s dramatic gestures and exaggerated steps. Schuller was well-known locally, and the decade of the 1970’s would make him a national figure. Working with Billy Graham's production team, he began broadcasting his sermons. Schuller also held the first of his annual conferences called the “Robert Schuller Institute for Successful Church Leadership” in the fall of 1969. This conference, over the years, has influenced megachurch preachers such as Bill Hybels, Rick Warren, and Kirbyjon Caldwell. Often, when reading about Fosdick and Peale, the similarities with Schuller are striking. Schuller is clearly in this line of therapeutic religion. He responds to humanity’s loss of identity and control by encouraging Possibility Thinking, which will empower the individual to be successful. Schuller uses a metaphor to express what he sees as a “general dissatisfaction” or malaise in mankind. The feeling is like a man who is awoken by hunger, gets up and looks in the refrigerator. But he doesn’t see anything he wants, because he doesn’t know what he wants. So the man just goes back to bed unsatisfied. It is this dissatisfaction and restlessness that Schuller believes can be overcome by Possibility Thinking built upon a theology of self-esteem. Schuller writes about why we have this unsatisfied hunger for glory, which results in low self-esteem. The center of original sin is that we, unlike Adam, are born without trust. We are, by our nature, insecure. This inferiority complex is the energy behind the defense mechanisms we use to protect ourselves from exposure and embarrassment. He sets this in contrast to classical theology which has always emphasized the negative interpretation of “Oh God, keep me from committing conspicuous immoral sins.” But this is non-constructive. The conclusion above was that the condition of modern humanity was problematic because one has lost both one’s identity and the control of one’s own destiny. In keeping with popular religion, Schuller has synthesized therapy with Christianity, as did Fosdick and Peale. He has incorporated the therapeutic ideals of shedding guilt, resentment, anxiety, discouragement and inferiority with core religious values in order to restore identity and control. While defending Schuller from attacks of preaching without a theological foundation, Voskuil does admit that Schuller is “something of a ‘johnny-one-noter’ who seldom varies his positive approach to the gospel.” As a result of his singular ministry, Schuller has helped to encourage many, but he fails to recognize the full range of emotions and qualities of the gospel that encompasses the entirety of humanity, not just the successes in life. Additionally, Voskuil claims, Schuller’s attempt to synthesize the tensions in religion and psychology, sacred and secular, glosses over the paradoxical nature of the gospel, and can develop into narcissistic religion. While I think that the critics often judge too harshly, it is undeniable that Schuller's message was feel-good religion, and this was his intention. He was very pragmatic, and he saw the Crystal Cathedral as a home for a certain type of person, but certainly not all; his focus and preaching style was directed more to the television audience, and he saw the show as a gateway for people who would tune out or turn off a heavy handed message. He was thrilled if people quit watching the Hour of Power to go to church somewhere. Robert Schuller, My Journey (San Francisco: Harper, 2001). Robert H. Schuller, Self-Esteem; the New Reformation (Waco, Tex. : Word Books, 1982). Christopher Lasch, The Culture of Narcissism; American Life in an Age of Diminishing Expectations. (New York: Norton, 1979). Roy Lewis, “Self-Esteem, the New Reformation,” Journal of Pastoral Care 37.1 (1983). Charles H Lippy, Being Religious American Style; A History of Popular Religiosity in the United States. (Westport, Connecticut: Praeger, 1994). David Singer, “The Crystal Cathedral: reflections of Schuller’s theology,” Christianity Today 24 (1980). Dennis Voskuil, Mountains into Goldmines (Grand Rapids, Mich.: Eerdmans, 1983).